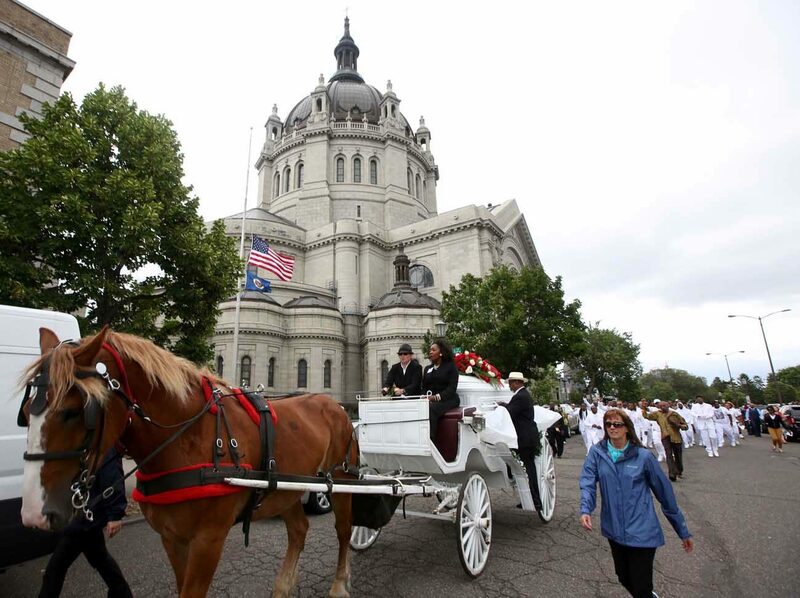 ST. PAUL, Minn. (CNS) — The Cathedral of St. Paul in St. Paul was filled with mourners July 14 for the funeral of Philando Castile, a 32-year-old black man who was fatally shot by a police officer during a traffic stop in Falcon Heights July 6. In remarks at the beginning of the service, Auxiliary Bishop Andrew H. Cozzens of St. Paul and Minneapolis said that “we stand together as brothers and sisters before our loving God united in prayer,” and linked the funeral to the Year of Mercy. Although the Castile family is Baptist, Castile’s mother, Valerie Castile, asked the cathedral to hold the service. Father John Ubel, the rector, who is a Pope Francis-appointed missionary of mercy, presided over the ecumenical service, which followed an adapted form of the Catholic funeral rite outside of the Mass. The Rev. Steve Daniels Jr., pastor of Shiloh Missionary Baptist Church in St. Paul, delivered a eulogy, where he called for unity, change and conversion. In short remarks before Scripture and poetry readings, family members remembered Castile as a respectful, caring man who was self-sufficient and loved his work as cafeteria supervisor at J.J. Hill Montessori Magnet School in St. Paul, where a reception was held following the funeral service. Castile’s death came a day after a black man was fatally shot by police officers in Baton Rouge, Louisiana. The deaths are the latest among officer-involved shootings of black men in the U.S., and prompted demonstrations nationwide to draw attention to racism. During a demonstration in Dallas July 7, a sniper shot and killed five police officers and wounded seven other officers and two civilians.. Following the service, Bishop Cozzens said was he moved by Rev. Daniels’ words during the eulogy when he “spoke like a father” and said “we’ve got to come together or we’re not going to make it.” One of the Gospel hymns with the lyrics, “God’s going to turn it around,” resonated with him, he added. “That’s our prayer,” he told The Catholic Spirit, the archdiocesan newspaper. Canon law permits a bishop to grant Catholic funerals for people who are not Catholic, but baptized. It also does not prohibit a Catholic church from being used for non-Catholic funerals or other events, as long as they are not contrary to the holiness of the sacred space. Minnesota Gov. Mark Dayton, U.S. Sens. Al Franken and Amy Klobuchar, other public servants and clergy from a variety of denominations attended the funeral, as did several priests, seminarians and Little Sisters of the Poor. Mother Maria Francis Pale, local superior of the Little Sisters of the Poor in St. Paul, attended the service because she believes it’s important for people to stand together in times of joy and in times of pain. “I want to really share the pain and pray, and pray for the country,” she told The Catholic Spirit. That the cathedral would open its doors to host a non-Catholic event seemed natural to her because the Little Sisters’ Holy Family Residence in St. Paul serves all denominations and races. Trygstad is assistant editor and Wiering is editor of The Catholic Spirit, newspaper of the Archdiocese of St. Paul and Minneapolis.